The Minnesota Twins have a problem. They have too many good outfielders. During the second half of the 2008 season, the Twins were one of the best clubs in baseball, thanks in most part to the stellar play of their outfield. Carlos Gomez, although he was demoted to the nine hole from the leadoff spot, provided an instant spark on the bases and in the field. Newly aquired Delmon Young batted a consistent .300, and showed his strong arm time and time again. And midseason callup Denard Span, Torii Hunter's protege, gelled at the leadoff spot, and finished in the top-5 in AL Rookie of the Year voting. LF/DH Jason Kubel, who has been harassed by bad knees during his career, was the most picked-up player in fantasy baseball during the second half of the season, and hit a career-best 20 home runs. Michael Cuddyer, who missed most of the 2008 season, is back and ready to regain his outfield position. But here is the problem: There has to be an odd man out. If the Twins wan to keep their momentum from last season, why change anything in the outfield? Keep Young, Gomez, and Span in the outfield, with Kubel DH-ing. So where does this leave Cuddyer?3B.The Twins drafted Cuddyer as an infielder in 1997, and played 2B and 3B in his first major league seasons. 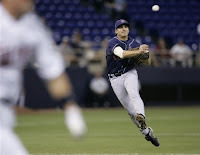 He replaced Corey Koskie at 3B when Koskie left for Toronto in 2004. Cuddyer struggled at 3B, and was soon delegated to bench duties. Although Cuddyer struggled at 3B, I think putting him here is the best option. Young, Span, and Gomez are all faster than Cuddyer, and all have better defense. Although Cuddyer has one of the stronger outfield arms in baseball, he can easily be replaced in RF by Delmon Young's cannon, who had 11 outfield assists last season. Since the Twins failed to sign veteran 3B Casey Blake, they have been immersed in trade talks to help the left side of the infield. Starting Cuddyer at 3B, with Brian Buscher and Brendan Harris coming in the later innings for defensive purposes, leaves the Twins to find a reliable shortstop (that can hit) and relief pitchers. The Twins do have Matt Tolbert returning this season after tearing a ligament in his finger, and always have the option of moving 2B Alexi Casilla to SS. The Twins are also reportedly talking to the Colorado Rockies about a deal for 3B Garrett Atkins and RP Huston Street, but the Rockies want SP Kevin Slowey and OF Denard Span. To me this looks like another Garza/Bartlett deal, which would leave the Twins with more holes than what they started with. Throughout his career, Garrett Atkins has hit below .240 away from Coors Field, which is the home of the Colorado Rockies. Cuddyer could hit at least .270 with 20 HR and 80 RBI if he hits 5th in the order behind Span, Casilla, Joe Mauer, and Justin Morneau. The Twins are also reportedly interested in Gold Glove third basemen Adrian Beltre of the Seattle Mariners, and former-MVP SS Miguel Tejada of the Houston Astros. If this doesn't appeal to the Twins, they could always deal Cuddyer for some middle inning relief, and take the risk of bringing up prospect Matt Moses, whom the Twins drafted in 2003. Moses hit only .234 in AAA-Rochester before being sent to AA-New Britan, but he is the most promising 3B in the minors for the Twins right now. If the Twins fail to make a reasonable deal for Atkins, or any other infielders, look for them to sign another Craig Monroe/Tony Batista/Livan Hernandez/Mike Lamb type player who will probably be gone my the All-Star break.